Having the 1970 VFL Grand Final as part of your resume might make it easy to pick the best or favourite game of your career but it didn’t for Reg Pawley. He simply placed it among the top thirteen because, for him, umpiring with his brother, Keith, was at the top – no doubt at all. Born in Melbourne on 13 December 1926 Reg was one of twins and both he and Keith grew up in Northcote. Umpiring was in their blood through their father, Ernest, who was a member of the VFL Umpires Association from 1929-1936. Reg began as a boundary umpire with the VFA in 1947 and the following year moved over to the VFL Second Eighteens as a field umpire. VFL umpiring was still expanding following the Second World War and opportunities were ample for keen young men. Promoted to the VFL senior list in 1950 Reg showed early promise by being appointed to two VCFL finals in his second season. He finished the 1952 season with a flourish by umpiring the first six of his fifteen VFL Second Eighteen matches and the Hamilton and District Football League Grand Final. Three other VCFL Grand Finals followed in the next eight years: South-West District Reserves (1956), Central Glenelg (1957) and Tyrrell (1958). In addition there were twenty-three other country finals – at least two every year – and the Tyrell v. Southern Mallee inter-league match in 1958. Over twelve seasons Reg umpired 213 VCFL, fifteen Second Eighteen, four Tasmanian and one Metropolitan match. Debuting in same match as Peter Hudson who kicked four goals, Reg claimed Heritage Number 150 at Princes Park in round two. His path would regularly cross with the great full-forwards of the era and later that season he was one of the goalies as Doug Wade kicked 13.7 to outscore South Melbourne on his own. Hudson went even better in 1969 kicking 16.1 against Melbourne, again with Reg in the goals. Yet it was not always a goal feast; in 1968 Collingwood kept Reg busy with behinds as they registered 2.19 at home to lose to the Saints. The out of bounds on the full law introduced an era of high scoring and Reg’s biggest was in 1971 when Collingwood registered 30.20 (McKenna 12) against Essendon but there were plenty of scores above 150. There were the remarkable as well; St.Kilda coming from eight goals down at half time to defeat finalists Richmond in 1975 and Reg’s only draw – Footscray and North Melbourne in 1973 – on the only day in VFL history when both the reserves and senior matches finished with scores level. 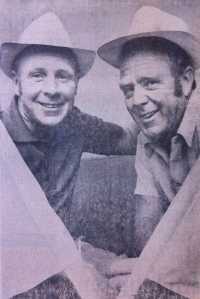 In 1969, having umpired on the same list as field umpires for more than a decade, Reg and his twin were re-united when Keith was promoted to the senior goal umpires list. On 28 June (round 12) at Victoria park they fulfilled a dream and became (and remain) the only twins to have goal umpired a VFL/AFL match. As youngsters Reg and Keith were passionate about their football teams. Reg was Collingwood and Keith Richmond. Interestingly nine of the twelve matches that they umpired together involved Collingwood or Richmond but in the two matches in which they played each other Richmond had the edge, winning the 1972 Qualifying Final and knocking the Magpies off at Victoria Park in 1975. The 1970 VFL Grand Final is an iconic event in Australian sport . Reg was appointed to the match after an outstanding season that included the Victoria v. Western Australia thriller in June. Played in front of the record VFL crowd Collingwood looked home at half-time when they led by 44 points but Carlton’s third-quarter revival had them only seventeen points behind a the last break. They completed their comeback with last quarter goals to Nicholls (2), Hopkins, Croswell and Jesaulenko all but one over the head of Reg Pawley. The shot that didn’t go over Reg’s head perhaps sums him up as a goal umpire. At the 28-minute mark with Carlton five points up, the VFL Grand Final on the line and 121 000 fans screaming Jesaulenko punts haphazardly towards a vacant goal square, the ball takes an improbable bounce and rolls slowly through the goal to undoubtedly seal the premiership. Never one for theatrics and always the professional Reg simply watched the ball, quietly signalled the goal and got on with business. By the time Reg retired at the end of the 1976 season he had amassed 172 VFL matches, including four finals and an interstate match. Combined with his field umpiring and thirteen VCFL goal umpiring appointments it amounted to 423 matches service to the VFL and the country competitions. Simply outstanding. Reg was awarded Life Membership of the Umpires Association in 1960 and was further recognised as one of the inaugural inductees of the AFLUA Hall of Fame in 2008. In retirement he contributed to the social life of the umpiring fraternity by regularly organising Bowls Days, one of the many avenues for umpiring reunions. He loved attending the annual Past Grand Final Umpires Function and was always ready to regale newer members with yarns from his days at the top.Not content to limit his interests to football Reg was also heavily involved in cricket and lawn bowls. 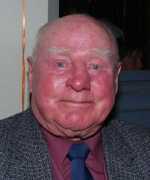 He played cricket with the Dennis CC, captaining the team from 1966-69 and served in various committee positions for 23 years and he was heavily involved with Faircote Bowls Club, again both as player and committeeman.